On Saturday, May 4, 2019 we offer tours of the brilliant 3rd order Fresnel lens. With luck, we will also see the last of the gray whales migrating north, possibly including some mother-calf slowpokes. This is a unique opportunity to visit the Lantern Room and the beautifully restored operational 3rd order Fresnel lens. These tours are offered only eight days each year. Tours are offered from 10am until 4pm. Be sure to allow time for the half mile walk to the lighthouse. 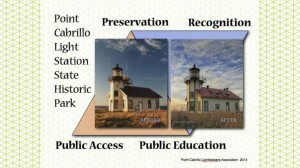 Tickets are $5.00 per person; the fee supports the lighthouse maintenance fund. The tours are a treat for the whole family but please note that children must be at least 42 inches tall to participate. See our Events page to learn more.